The ST850 is Airmar's standard, thru-hull speed sensor. Digital signal processing inside the housing provides speed and temperature data to a chart plotter, radar screen, or digital display in analog format. The plastic P17, bronze B17, and stainless steel SS577 housing options are available to meet most hull requirements. These low-profile units are nearly flush and minimize drag with only 5 mm (3/16") extending outside of the hull. 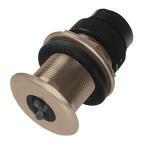 The ST850 is Airmar's standard, thru-hull speed sensor. Digital signal processing inside the h.. 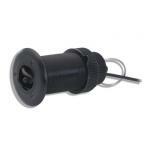 The ST850 is Airmar's standard, thru-hull speed sensor. Digital signal processing inside the .. Fits P17 & B17 housing sold separately.Fits: ST30, 40, 50, 60, i40, i50, i60Replacement insert o..